Every Christmas Eve, the North American Aerospace Defense Command in Colorado Springs, Colorado, claims to track Santa Claus' flight across the globe, a tradition dating to 1955, when a department store printed the phone number of a NORAD colonel in a Christmas newspaper ad by mistake. 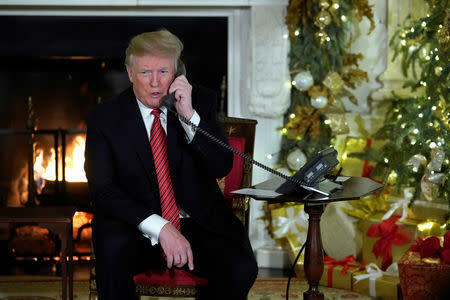 This year, though, the NORAD calls came at a precarious time for the president, who is mired in crises, from a government shutdown that has affected a quarter of federal agencies and departments to a stock market selloff amid Trump's public criticisms of the Federal Reserve. He has also used the time to tweet about people and subjects such as outgoing Defense Secretary James Mattis, who abruptly resigned last week following Trump's decision to withdraw U.S. troops from Syria; North Korea; the Fed; and Senate Foreign Relations chairman Bob Corker. Trump's Republican Party holds majorities in both congressional chambers until Jan. 3, when Democrats take control of the House of Representatives. "Are you still a believer in Santa?" he asked his interlocutor. "Nothing new," Trump said. "We need border security."